Art Club meets every Monday & Tuesday 2:20 pm to 4pm. This is the forum for adventure! *participate in the creation of wearable art for NAC's Strutt! 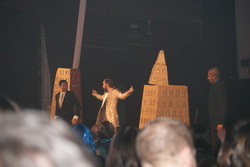 Art Club students collective creation titled "Corporate Collision/Middle Finger Salute" on stage of Niagara Artists Center's Wearable Art Show Strutt, November 2013 & 2014. Created by: Ms. Wilkinson, Sam Lea, Jen Lea, Matt Ellis, Rosie Proctor, Talli Williams, with the help of Christie Tran, Kaye Change, Amanda Keech, Rail Thornwell, Denver Bylsma, Felicite Piche-Blaney, Giordana Scodellaro. 2014/2015: Giordana Scodellaro, Julia Munro, Caleigh Ellis, Andrea Barlow, Audrey Peters. Wearable Art designs from Crossley's Catwalk and Niagara Artists Centre's Strutt.